Flexible smartphones were once talked about as being the ‘next big thing’ for the industry, but apart from the occasional limited demonstration at a convention, the hype surrounding the technology has died down – possibly because it’s taking so long to arrive. 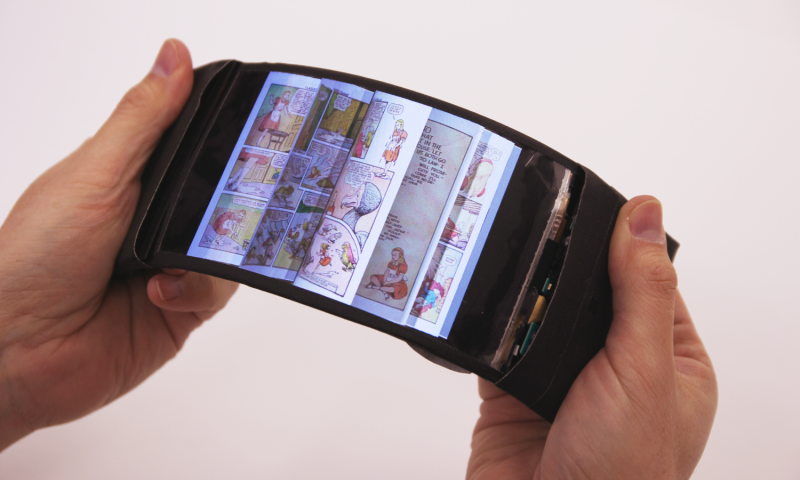 But now, Canadian researchers have created a device that may be the first step toward a truly flexible smartphone screen. Created by researchers at Queen’s University Human Media Lab, the prototype ReFlex is the world’s first flexible smartphone to feature a full-color, high-resolution display and wireless technology. ReFlex uses a 720p LG Display Flexible OLED touchscreen and is powered by an Android 4.0 KitKat board mounted on the side of the display. It also features a voice coil that allows the phone to simulate forces and friction through highly detailed vibrations. Being flexible doesn’t just make the ReFlex look cool, the device lets you use its physical properties as a way of interacting with certain software. There are sensors on the back of the display to measure the amount of force you’re using to bend it, which is then translated into actions within various apps. "This represents a completely new way of physical interaction with flexible smartphones," said lab director Roel Vertegaal in a press release. When reading an ebook, for example, an extreme bend will flip through the pages faster. You can even aim your slingshot in Angry Birds by bending the screen. The smartphone’s vibrations will make it feel like the pages are flicking across your fingers, or imitate the sensation of a rubber band being stretched. "Users can feel the sensation of the page moving through their fingertips via a detailed vibration of the phone. This allows eyes-free navigation, making it easier for users to keep track of where they are in a document," Vertegaal said. The ReFlex prototype will be presented at the Conference on Tangible Embedded and Embodied Interaction in Eindhoven today. Check out the video below to see it in action.